Following the nine-minute preview for Justice League: Throne of Atlantis released in August, Warner Bros. Home Entertainment has finally released the first trailer for this highly-anticipated animated adventure. Before we get to the new footage, Newsarama has a new synopsis for this comic book adaptation, which you can take a look at below. "As Orm and Black Manta make their move against the surface world after the battle with Apokolips forces in Justice League War had deadly consequences for Atlantis, the queen of the lost underwater civilization searches for her other son, Orm's half brother Arthur. Living on the surface world with powers he doesn't understand, Arthur Curry steps into his destiny as Aquaman, teaming with the Justice League to save and unite all people of the world." Matt Lanter leads an impressive voice cast as Arthur Curry/Aquaman, alongside Sam Witwer (Orm/Ocean Master), Christopher Gorham (The Flash), Jason O'Mara (Batman), Shemar Moore (Cyborg), Rosario Dawson (Wonder Woman), Jerry O'Connell (Superman), Nathan Fillion (Green Lantern) and Sean Astin (Shazam). 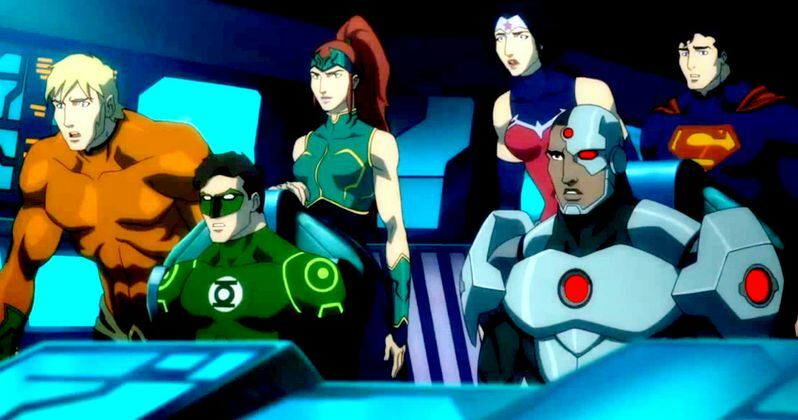 Warner Bros. Home Entertainment hasn't announced exactly when Justice League: Throne of Atlantis will be released next year, but take a look at the first footage and stay tuned for more updates.